Suitable for residential and commercial projects, LoĒ3 – 366®, the ultimate performance glass, delivers an ideal balance of thermal control and high visibility. It provides the highest levels of year-round comfort, UV protection and significant energy savings. Unlike tinted glass, LoĒ3 – 366® doesn’t spoil the view as it has a unique ability to reject solar heat without compromising visibility. 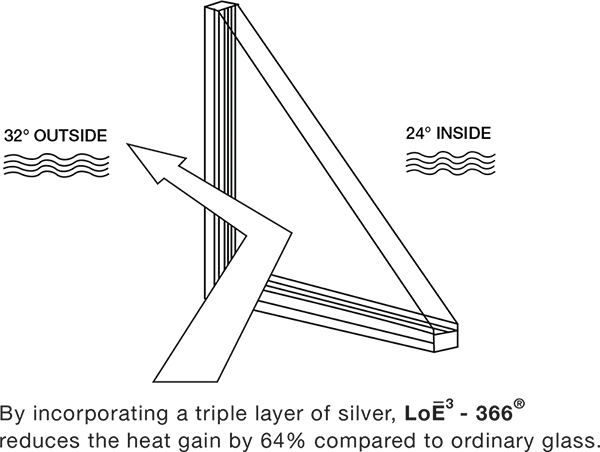 LoĒ3 – 366® has been specially formulated to reject the sun’s heat without affecting the view. It lets more light in and keeps more heat out. So households and businesses remain cool and comfortable while enjoying optimum glass clarity. LoĒ3 – 366® also provides exceptional fading protection. It blocks 95% of the sun’s damaging ultraviolet rays (a leading cause of fading), providing protection from the damaging effects of the sun’s rays. During cold weather, the insulating effect of your windows has a direct impact on how your rooms feel. Typically, 75% of the exposed surface of a window is glass, and the temperature of the room-side of the glass directly affects the air temperature in the room. Consequently, when glass surface temperature falls below 11°C, there is risk of thermal discomfort. To maintain the best comfort during winter, LoĒ3 – 366® produces near constant surface temperatures, so buildings keep warm during the coldest months. Neat® technology – a self cleaning coating which uses the sun’s rays to loosen dirt so rain can wash it away. This is due to the titanium dioxide layer which reacts chemically with the sun’s UV rays and causes any organic matter on the glass to decompose and rinse away with the rain. A silicon dioxide layer is also present, which makes the glass ultra smooth, allowing water to evaporate quickly to reduce water spotting. Enjoy the added convenience and cost benefits of less window cleaning. 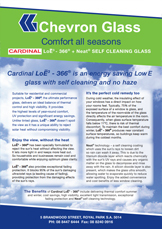 The Benefits of Cardinal LoĒ3 – 366® include delivering thermal comfort summer and winter, cost savings, high visibility, excellent light transmission, exceptional fading protection and Neat® self cleaning technology. Low E in the areas of visible light transmission, solar heat gain (SHGC) and U-Value (insulation).